Nicky Boulger, office manager for Wyman Museum, has been employed at the museum since 2005. She said planning events such as Pumpkin Patch and Winter Festival is her favorite aspect of the job. Nicky Boulger contends she isn’t as cool and collected as she appears. Boulger, 36, has been office manager for the Wyman Museum since 2005. Her duties as office manager include planning events at the museum such as the annual Pumpkin Patch, Sheep Wagon Days and Winter Festival. “I love planning the events,” Boulger said. “That’s probably one of my favorite things to do. However, Boulger said event planning wasn’t something she had experience with before going to work at the museum. In fact, the only event she had planned occurred seven years earlier — her wedding. Boulger said the wedding, which took place at her parents’ home on Thompson Hill in Craig, was successful, albeit somewhat stressful. “I was cool until the day of. I was stressed-out about chairs,” she said laughing. Boulger was born in 1974 in Paducah, Ky. Her family moved to Craig a year later. “I’ve been here ever since,” she said. Boulger attended Sunset and Ridgeview elementary schools, and graduated from Moffat County High School in 1993. In school, Boulger played volleyball. She was also on the diving team for a brief time. During high school, at age 15, Boulger got a job at McCandless Animal Hospital. “I cleaned kennels,” she said of her early days at the animal hospital. Boulger is a self-described animal lover. Today, Boulger has six horses, 12 dogs, two cats and an aquarium at her Craig home. Boulger stayed at McCandless for 15 years. During that time, she worked her way up to a veterinary tech position. Then, at age 30, Boulger gave birth to her daughter, Trinity. With a baby in tow, Boulger needed to work fewer hours. 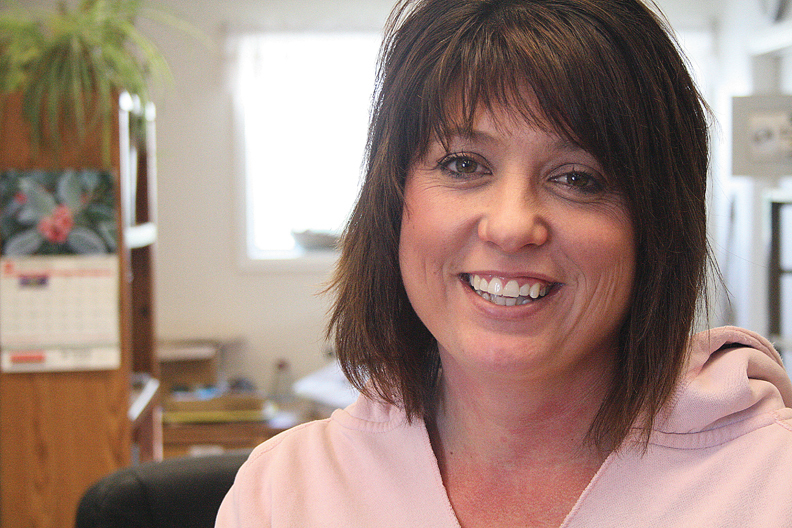 Her employer, Neil McCandless, helped her find a new job. “I knew Neil really well, and he was really good friends with Lou (Wyman),” Boulger recalled. “Neil said Lou was opening up a museum and needed someone to catalogue. Boulger said the first Wyman Museum event was underwhelming compared to what she does now. “The first event I did was a vintage antique snowmobile show. I remember, I just kind of came to help out,” she said. “We had a whopping 11 sleds displayed throughout the day. That’s all there was. There was no food, no entertainment, there were just the sleds. Boulger estimates that she plans six to seven events every year. She said Wyman is supportive. Being a mother of a young child provides insight when planning family-oriented events, but it’s not everything, Boulger said. Trinity likes the events, Boulger said, but the two seldom get to participate in them together. Nonetheless, Boulger said she appreciates that her daughter gets to spend so much time at the museum. “She definitely loves the museum,” Boulger said. “It’s like a second home to her. Bolger said her confidence, like the events at the museum, has grown as the result of her work. “I remember the first time I had to stand in front of the commissioners and ask for something,” Boulger recalled. “I broke out in a rash, and it was hard to breathe.